Dr. Villanueva's research focuses on the development of medical diagnostic and therapeutic strategies based on ultrasound and ultrasound contrast agents (gas-filled microspheres, or microbubbles). Her work has consistently bridged fundamental imaging sciences with translational biomedical research. As an Established Investigator of the American Heart Association, she has been a leader in the development of microbubbles for the assessment of myocardial perfusion, and ultrasound molecular imaging with targeted microbubbles for the detection of inflammatory and angiogenic endothelial markers in pre-clinical models of heart disease. Dr. Villanueva's lab has pioneered the development and application of microbubbles as molecular probes, and acoustic detection strategies for optimizing imaging sensitivity. Her lab group has applied fundamental principles of ultrasound and the physics of microbubble acoustic behaviors to develop novel targeted molecular therapeutics, whereby nucleic acid loaded microbubbles (siRNA, miRNA, plasmid), in the presence of precisely tuned ultrasound, selectively enhance membrane permeability and deliver payloads to the target site. These studies are conducted at the Center for Ultrasound Molecular Imaging and Therapeutics, a translational multidisciplinary research facility which epitomizes the reciprocal relationship between imaging sciences and biomedical translational research. 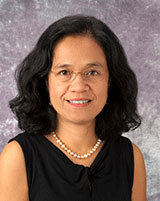 Dr. Villanueva's clinical focus is on non-invasive cardiac imaging, and she currently is the Director of Non-Invasive Cardiac Imaging for the Cardiovascular Institute based at Presbyterian University Hospital, UPMC. As the founding Director of the Center for Ultrasound Molecular Imaging and Therapeutics and Director of Non-Invasive Cardiac Imaging for the Heart and Vascular Institute at UPMC, Dr. Villanueva has continuous exposure to a pool of outstanding trainees and is deeply committed to their mentoring as future clinical and basic translational scientists. Helfield B, Chen X, Qin B, Villanueva FS. Individual lipid encapsulated microbubble radial oscillations: Effects of fluid viscosity. J Acoust Soc Am. 2016; 139(1): 204-14. Kopechek JA, Carson AR, McTiernan CF, Chen X, Hasjim B, Lavery L, Sen M, Grandis JR, Villanueva FS. Ultrasound Targeted Microbubble Destruction-Mediated Delivery of a Transcription Factor Decoy Inhibits STAT3 Signaling and Tumor Growth. Theranostics. 2015; 5(12): 1378-87. Chen X, Wang J, Pacela JJ, Villanueva FS. Dynamic Behavior of Microbubbles during Long Ultrasound Tone-Burst Excitation: Mechanistic Insights into Ultrasound-Microbubble Mediated Therapeutics Using High-Speed Imaging and Cavitation Detection. Ultrasound Med Biol. 2016; 42(2): 528-38. Yu FT, Chen X, Wang J, Qin B, Villanueva FS. Low Intensity Ultrasound Mediated Liposomal Doxorubicin Delivery Using Polymer Microbubbles. Mol Pharm. 2016; 13(1): 55-64. Pacella JJ, Brands J, Schnatz FG, Black JJ, Chen X, Villanueva FS. Treatment of microvascular micro-embolization using microbubbles and long-tone-burst ultrasound: an in vivo study. Ultrasound Med Biol. 2015; 41(2): 456-64. Leng X, Wang J, Carson A, Chen X, Fu H, Ottoboni S, Wagner WR, Villanueva FS. Ultrasound detection of myocardial ischemic memory using an E-selectin targeting peptide amenable to human application. Mol Imaging. 2014; 13: 1-9. Yu, FT, Villanueva FS, Chen X. Radial modulation contrast imaging using a 20-MHz single-element intravascular ultrasound catheter. IEEE Trans Ultrason Ferroelectr Freq Control. 2014; 61(5): 779-91. Helfield B, Black JJ, Qin B, Pacella JJ, Chen X, Villanueva FS. Fluid Viscosity Affects the Fragmentation and Inertial Cavitation Threshold of Lipid-Encapsulated Microbubbles. Ultrasound Med Biol. 2016; 42(3): 792-94. Kopechek JA, Carson AR, McTiernan CF, Chen X, Klein EC, Villanueva FS. Cardiac gene expression knockdown using small inhibitory RNA-loaded microbubbles and ultrasound. PLoS ONE. 2016; 11(7): e0159751. Helfield B, Chen X, Watkins S, Villanueva FS. Biophysical insight into mechanisms of sonoporation. Proceedings of the National Academy of Sciences. 2016.